The Public Services Department’s Forestry work group is responsible for planting, trimming, and removal of the City’s living family of approximately 11,000 trees located within various public right-of-ways, parks, and other City facilities. These important public assets enhance the quality of life in the community in a variety of ways, and the City is committed to their proper maintenance and upkeep. During the winter months as conditions allow, street sweeping personnel are often assigned to trimming to supplement the 3-person full-time forestry crew, and seasonal employees are often employed during the summer months to assist with watering. From time to time, due to age, disease, or damage, trees must be removed. The Department generally strives to replant in these locations within one year of removal, and home owners are typically notified of the time frame. Due to concerns over species diversification, some types of trees are no longer planted, but the City tries to select those specimens that can add the most value to the surrounding area while guarding against disease. In 2017, the Department has also been working with a contractor on a widespread gateway planting initiative along North Dixie Highway and South Monroe Street to plant over 250 trees in these areas lacking sufficient tree cover. 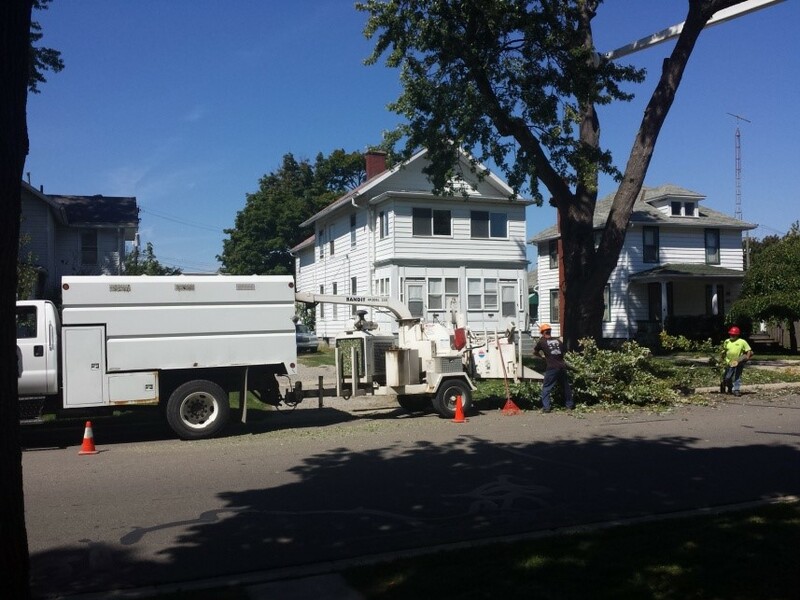 Generally, the City of Monroe will not remove healthy living trees, but will trim dead and diseased portions of trees upon request, usually within 30 days. To report an issue, please follow the reporting link below. For any questions regarding the City of Monroe’s urban forestry program in general, please contact the Department of Public Services. The City’s Geographic Information System (GIS) has a layer containing information on all of the City’s trees, and this can be accessed via the link below. Downed limbs or trees that are an immediate threat to public safety, such as those blocking roadways or entangled with power lines, should be referred to Monroe County Central Dispatch immediately at 734-241-3300.